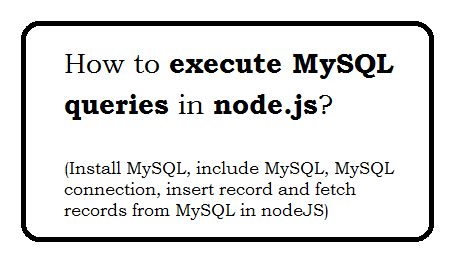 How to execute MySQL queries in node.js? Question: How to install mysql in nodeJS? Question: How to update mysql in nodeJS? Question: How to include MySQL in nodeJS? Question: How to handle error while connecting to MySQL in nodeJS? Question: How to insert record in database with nodeJS? Question: How to print SQL query in nodejs? Question: How to insert record in database - Full Example? Question: How to fetch all records in nodeJS?